You might not be able to see it, but it’s actually one of the most important parts of your aquarium. No, I’m not talking about the canister filter hidden away underneath your aquarium. It’s funny – one of the only times you will think about the oxygen in your aquarium is when it isn’t there. And by then it’s too late. So sit back as I teach you everything you need to know about this important aquarium ingredient. Where does the oxygen in your aquarium come from? How much oxygen does your aquarium need? How do you know if your aquarium is low on oxygen? What causes low oxygen in aquariums? How do you test the oxygen levels of your aquarium? How do you increase the oxygen levels in your aquarium? What do you do in an oxygen emergency? 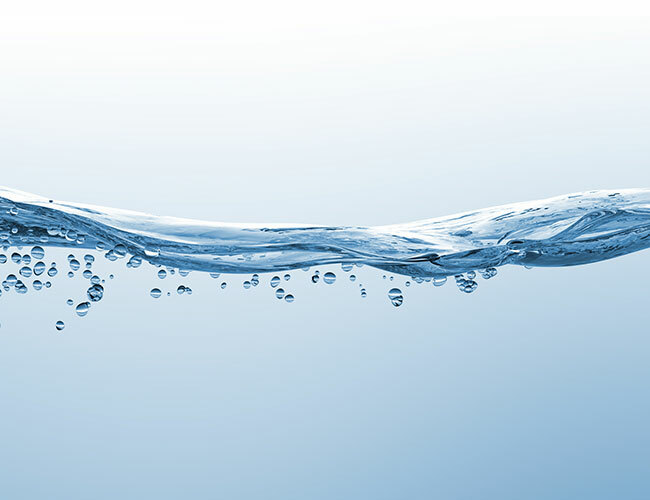 Even though H2O (Water) is part oxygen, it is bonded with hydrogen – essentially locked together, thus making it inseparable. Your fish can’t breath this. So if that’s the case, then where does the oxygen that your fish breath come from? Believe it or not, plants and fish actually breath the exact same oxygen as you and I. The surface of your aquarium is always in contact with the air. 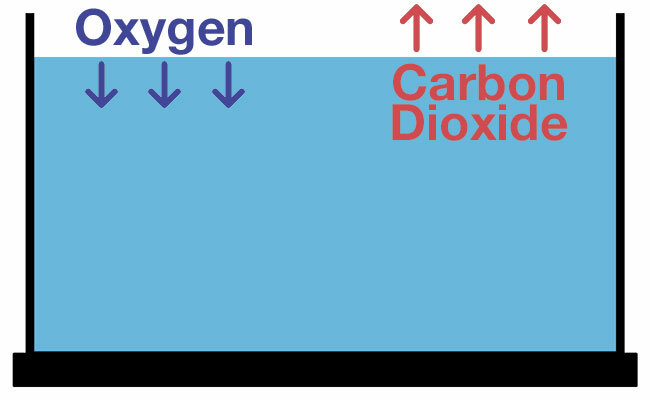 And it is here, at the surface, that oxygen enters the water through a process known as gas exchange. The reason it is called gas exchange is because the air and water do a trade. The water in your aquarium swaps carbon dioxide (CO2) for the oxygen (O2) in the air. Since fish breath in this oxygen and give off carbon dioxide, this exchange is a continuous process. It is also worth mentioning that the larger the surface area of the water, the more efficient the gas exchange. So a larger tank is much easier to oxygenate than a small one. Once the oxygen enters the water, it is referred to as dissolved oxygen. When discussed online, dissolved oxygen is often shortened to DO. How much oxygen does your fish tank need? 1. Water temperature – As the water temperature increases, the amount of oxygen that water can hold decreases. Tropical fish have less oxygen in their water than cold water fish. 2. Salinity – To put it simply, salinity is the measure of the amount of dissolved salts in your water. The saltier your water, the less oxygen it can hold. You can test the salinity of your aquarium with a refractometer. 3. Atmospheric pressure – The lower the air pressure, the less oxygen the water can hold. It may surprise you to learn that, all thing being equal, water in Miami (altitude 6 feet) can hold more oxygen than water in Denver (altitude 1 mile). Generally speaking, larger fish need more oxygen than smaller fish, while slower moving fish need less oxygen than fast swimmers. So, as you can see – the answer to how much oxygen your aquarium needs isn’t exactly clear cut. That said, there are recommendations as to the ideal oxygen levels for certain aquariums, measured in Parts Per Million (PPM). Please note that these are only loose guidelines and the previous factors I listed will impact just how much oxygen can dissolve in your tank. But if your fish are behaving normally, and are not gasping for air at the surface of your aquarium, then it is a good sign that there is enough oxygen in your aquarium. In fact, fish behavior and oxygen levels go hand in hand. Above, you can see a picture of water that is high in oxygen. I don’t care how good your eyesight is, it is practically impossible to determine if water has an oxygen shortage just by looking at it. By looking at your fish. Your fish will behave differently according to just how much oxygen is in the tank. The first sign that you have an oxygen problem is slower movement. At the first sign of low oxygen levels, fish will slow down and swim less. This is particularly noticeable in active fish. Fish Fact: When oxygen levels in an aquarium or pond are too low, this is referred to as hypoxia. If you look closely at the gills, you will notice them moving rapidly as your fish desperately attempts to get enough oxygen by passing more water than usual through their gills. If the oxygen levels are drastically low, then the symptoms become obvious – your fish will gasp for air at the top of your aquarium. Your fish will look noticeably distressed as they attempt to draw oxygen from the most oxygen-rich location in your aquarium, the surface layer. If your tank is home to many different types of fish, you may notice that only a few gasp at the surface for air. You should still be concerned, as those that are not gasping for air are probably stronger or require less oxygen – they too will eventually be affected by low oxygen levels if the problem is not corrected. 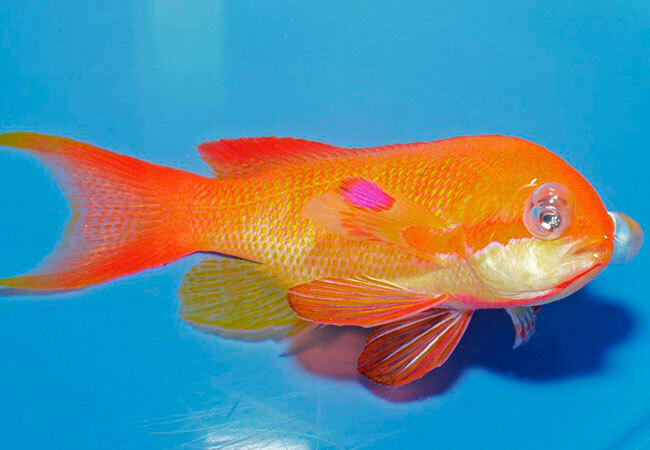 Fish show these obvious signs of stress when the oxygen content of water drops below 4 PPM. If the oxygen drops below 2 PPM, death will soon follow. Fish like bettas, gouramis and paradise fish often take a gulp of air from the surface. This is normal behavior and should not be confused with fish that remain at the surface gasping for air with their mouths wide open. By far the most common cause of low oxygen levels in aquariums is overstocking – keeping more fish than is appropriate for your tank. Each fish that you add to your tank needs oxygen to breath. And once you add too many fish, the oxygen in the water will be consumed at a faster rate than it can be replenished. And the consequence is that there isn’t enough oxygen in the tank for your fish to breath. There are calculators available online that can help assist you with how many fish you should stock in your tank. Compared to overstocking a fish tank, the remaining contributors to declining oxygen are quite minor. However, when combined with an overstocked aquarium, these factors can be dangerous. Living plants use carbon dioxide (CO2) and give off oxygen – so how can they contribute to lower oxygen levels? Plants only give off oxygen when exposed to light, whether that’s natural daylight or the light from your LED setup. When night falls, and the tank turns dark, the opposite happens – plants consume oxygen and give off CO2. If your planted aquarium has reduced or no light for an extended period of time, the plants could deplete enough oxygen to affect your fish, especially in an overstocked tank! Note: Algae is also a plant, and this problem can also occur in tanks with a heavy algae bloom. As I touched on earlier in this article, warm water cannot hold as much oxygen as cool water. In summer, the water temperature of your aquarium can spike – especially if it sits in direct sunlight, like near a window! And when this happens, there is going to be less oxygen in the water for your fish. But it does kick off a chain of events that can lead to low oxygen levels, so I felt that it should be included in this list. Bacteria that feed on these waste products also require oxygen, further depleting the oxygen levels in your tank. Excess waste can also lead to an algae bloom, which can also lead to oxygen loss. Oh, and if that’s not enough, too much ammonia from waste can irritate your fish’s gills, making it more difficult to draw oxygen out of the water. Long story short – don’t let waste build up in your tank! 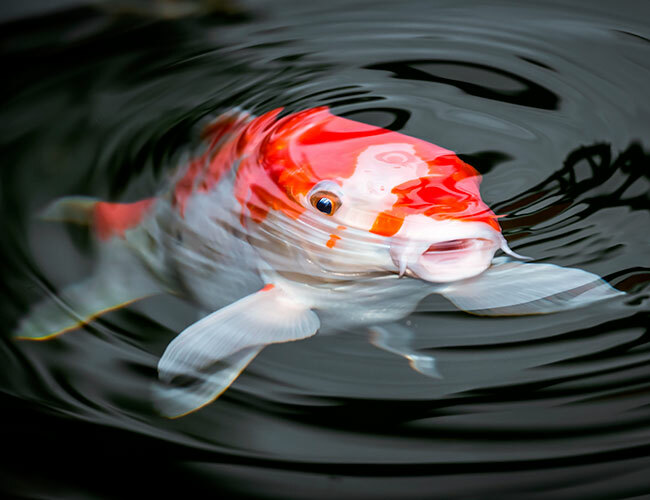 Certain medications for fish disease and chemicals like water conditioners can have a direct impact on the oxygen-carrying ability of the water in your tank. When using chemical additives, it is recommended you always read the instructions to determine if they will cause any negative effect, like lower oxygen levels. If you have ever tested the pH of your aquarium, you will be all too familiar with colorimetric tests. 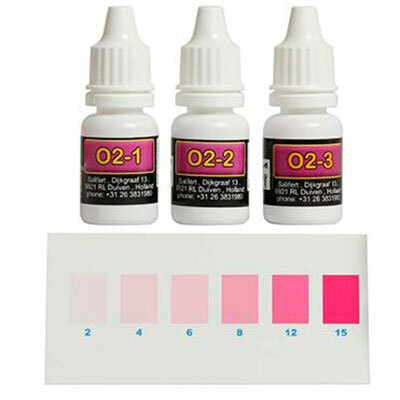 Well, aquarium test kits work in a similar way, and can even be used to check the oxygen levels in your aquarium. Simply add the drops to a sample of your aquarium water and compare the color to the chart to determine the amount of dissolved oxygen in your tank. Generally speaking, the more expensive the test kit, the more accurate the reading will be. That said, being precise isn’t too important to hobbyists, who will generally only need a rough idea of their dissolved oxygen levels. Each dissolved oxygen test kit is capable of performing multiple tests. The Salifert test, pictured above, is capable of performing over 40 tests. If you have the cash to spare, a dissolved oxygen meter precisely measures your aquarium in just a few seconds. Stick the probe in your aquarium and the amount of oxygen in your aquarium will be displayed on the LCD screen. 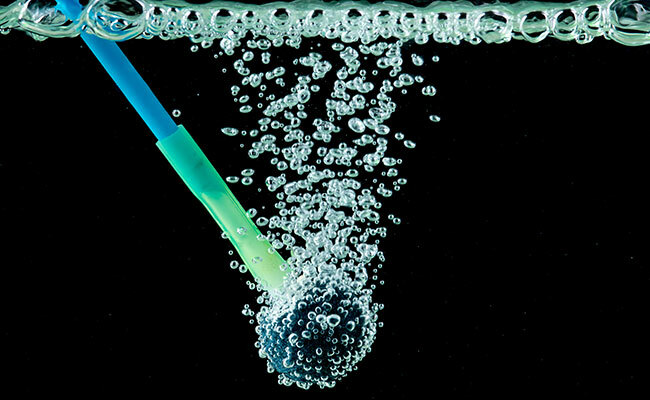 While a dissolved oxygen meter may be more accurate than a test kit, it also requires continual maintenance to ensure the results remain accurate. 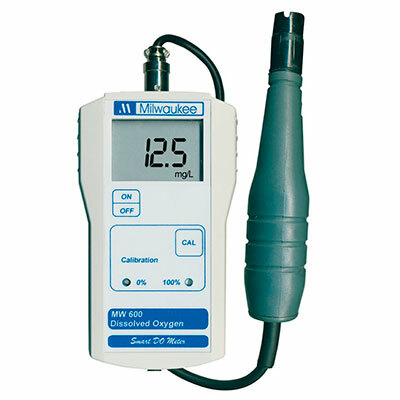 Membranes and batteries must be replaced and the meter must be calibrated regularly. But if you want the most accurate measurement possible, You can’t go past a dissolved oxygen meter. An airstone agitating the surface water. Well, the first thing you want to do is remove all the contributing factors to oxygen depletion that I mentioned earlier, namely overstocking your tank. With that out of the way, there is actually a clever trick you can use to increase the amount of oxygen in your tank. I mentioned earlier how a larger tank exchanges gas more efficiently than a smaller tank due to the larger surface area of the water. Well, there is actually a way you can “artificially” increase the surface area of your aquarium. And that method is surface agitation. To put it simply, water movement on the surface of your aquarium increases its surface area, allowing more oxygen to dissolve and more carbon dioxide to escape. By agitating the surface water in your aquarium, you can potentially stock more fish than you otherwise would have been able to without it. So you have just come to discover that panicked fish are gasping for air at the surface of the tank. There is no time to look for the cause of the problem, you can do that when your fish are safe. Right now, your priority is saving your fish. The easiest and quickest way to get oxygen into your aquarium is to immediately perform a large water change – as much as 50%. The new water will bring with it dissolved oxygen that should keep your fish happy in the short term. This will buy you some time so that you can hunt for the cause of the depleted oxygen. What happens if there is too much oxygen in an aquarium? Water can only hold so much oxygen before it reaches saturation. And once saturation is achieved, no more oxygen is going to dissolve in the water. 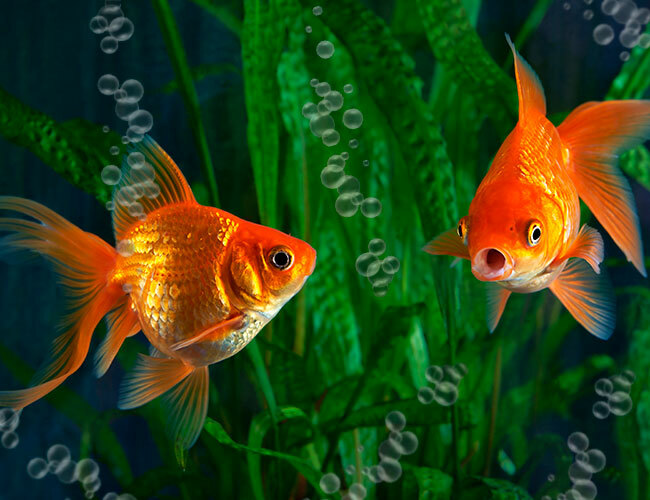 Your fish will happily breath in water that is saturated with oxygen – it’s harmless. But the problem comes when water is supersaturated with oxygen. And I must stress that this isn’t common in an aquarium environment. One way that tank water can become oversaturated is from a leaking water pipe or cavitating pumps that increase pressure, resulting in excess oxygen to dissolve in the water. The other way is through rapid heating of your aquarium. Because cold water can contain more oxygen than warm water, the oxygen gets trapped due to the extremely fast temperature change. When your fish breaths in the over-oxygenated water, the oxygen leaches out of your fish’s blood stream and forms bubbles in the tissues. Visible bubbles can form in the gills, fins and eyes of the fish. Gas bubbles can also build up in your fish’s heart, leading to death. It may be invisible, but there is no denying that oxygen plays a hugely important role in your aquarium. Do you regularly test the oxygen levels in your aquarium? Let me know in the comments below! Aquarium Nitrates and how to get rid of them! If anything it sounds like your filtration will produce quite a lot of current. Also, it’s easier and less dangerous to fish if you use a fishless cycle to kickstart bacteria growth. It’s going to be quite turbulent as it is, you won’t need any more water movement. Just be mindful that many fish prefer slower moving currents. Generally speaking, your filter should turn over 4 – 6 x the amount of water your aquarium holds in an hour. If you can do this, you can get away with weekly water changes. Extra filtration won’t really get away from performing maintenance. I was told by my local fish store–not a national chain — that I didn’t need an airstone. So I assumed that the motion of water falling out of the HOB filters I use was sufficient. Should I be buying air stones and pumps for various size tanks? I turn the filter flow down low for my betta tanks….one is in a 5-gallon quarantine and will be going in a community 20-gallon. The other betta tank is a 5.5 gallon also. Your web site is very informative! Thank you! It sounds like you received some good advice. If your filter is sized correctly, the outflow should agitate the surface enough for a correctly stocked tank. If you see water churning and moving (even slowly) around your tank, then it will likely be enough. I want to ask you about the relation between oxygen and carbon dioxide. What happen if we turn on a bubbler after we previously injected co2 into the water? Does the O2 will get rid the co2 or they both will be in the water at the same time? I’m having a big problem with the nitrates in my tank. It’s a new tank(2 months old). It has been cycled, I have tried using products to eliminate it. I’ve done water changes and gravel vacing once a week( I started out a every 2 weeks but it was recommended to me to go to every week). Its a 10 gallon tank with only 3 fish. Do you think that I cant get it under control because I don’t have something to make bubbles? Can low oxygen levels mess with the nitrates/nitrites? Nitrates are removed through water changes. For most freshwater tanks, it’s the only way to remove them. If they have built up to ridiculous levels, you may need to perform multiple or larger water changes. Once under control, you might need to switch to more than once per week – depending on which 3 fish you have, it may be too many for the tank which can cause them to build up quicker than usual. High oxygen is quite uncommon and typically only seen in heavily planted tanks – pearling plants is a sign. I’d be doubtful that your tank has excessive O2 levels. You should only make changes if your fish can handle that level of pH of the pH is rapidly fluctuating. In each case, both can stress your fish to the point of disease or death. It’s possible something is increasing the KH of your water which then causing the pH to rise. You’ll need a KH test kit to confirm this. For more information, check out this KH guide. Whether it’s O2 or KH you will only be sure if you test. We have just had a tank set up from a friend and we set it up 24 hours ago. We had 16 fish and then today we lost half of our fish. We had our oxygen levels tested and they were really poor. We also swapped the tank for one roughly half the size so I’m wondering if overcrowding contribited to the low oxygen issue. Anyway, we have gutted the whole tank so all of the water is fresh now and we have given the filter a thorough clean as it was full of allsorts. (We had been told not to clean the filter because of the beneficial bacteria that’s in it for the fish). We have also installed an airstone and have positioned the filter so that it acts as a powerhead. There are loads of bubbles in the tank now. I’m still worried about transferring the fish we have left back into the tank. I don’t want any more of them to die. Depending on the fish, it’s possible that halving the size of the tank contributed to the deaths of your fish – half the tank, half the oxygen. You can rinse your biomedia and it shouldn’t cause your cycle to crash. I’d recommend rinsing half one week and half the next as a precaution. And of course, rinse it in fresh water, chlorine will kill beneficial bacteria. I added to much air and had fish try to leap out of the tank hitting the lid and causing death. Bring your oxygen up slowly, is what I have found.